How do I keyword research for SEM? Similar to SEO, we will use the Google Adwords Keyword Planner tool for keyword research in SEM. There are also other tools you can use such as Wordtracker or Wordstream but Adwords Keyword Planner is the de facto standard tool. You can also access the tool within Adwords by clicking on Tools at the top of the page and selecting Keyword Planner. Once you are on the Keyword Planner tool, select “Search for new keyword and ad group ideas”. Once you have done one of the above and clicked the “Get Ideas” button, you’re going to want to navigate to the Keyword Ideas tab to view a list of keywords with its avg. monthly searches volume, competition level (low, medium, high), suggested bid and ad impression share. Keep in mind that the avg. monthly searches volume is not the exact figure and the suggested bid is only an estimate. Nonetheless, it’s good to compare keywords by looking at the avg. monthly searches. If you see one keyword that has higher avg. monthly searches than another keyword, it could mean that the keyword is more competitive. Comb through the list and copy and paste the keywords that are relevant to your website in an excel sheet. Once you have a comprehensive list of keywords, you can copy and paste it back into the Adwords Keyword Planner to get even more ideas. You can also check mark the keywords you want and download the list by clicking the Download button at the top right of the table. Rinse and repeat until you think you have all the keywords you need. You can also find related keywords by doing a search of your keyword on Google and getting the keywords from the suggested dropdown. 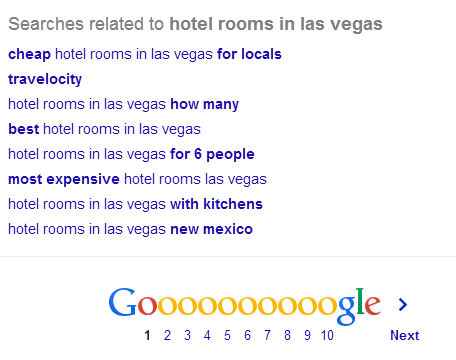 For even more keyword ideas, you can scroll down to the bottom of the page after you have searched your keyword. There will be a related searches list above the bottom pagination.